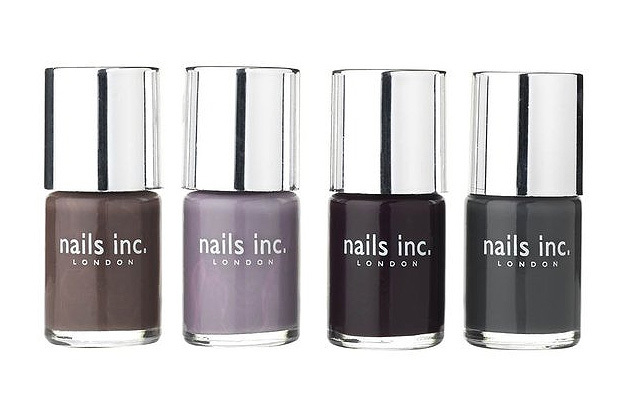 If you’re a Nails Inc. facebook fan you would have seen them post their sneak preview of the Autumn/Winter shades they have in store for us! You know when a child is doing something they shouldn’t… but it’s kinda cute and you can’t help but smile. Except, very small children have no concept of ‘pushing their luck’ and before you know it… something that was mildly amusing becomes a source of irritation. Ladies… I present you with ‘Grilac’. ‘Greige’ I can cope with… it rolls off the tongue. Grilac sounds like a BBQ cleaning fluid. Just stop it. It’s not big, it’s not clever and it stopped being cute last February. Grilac or no Grilac, what say you? I have two nails inc that look like the right two, but those 2 on the left..come to mama…..
Grilac – a big yes to the colour, but no to the name! It’s like the ‘Brangelina’, ‘Bennifer’ thing which has gone way too far and just started to annoy everyone now. Those colors look very pretty though! I love them!!! Cannot wait to get my mitts on this collection. Oooh those first 2 look gorgeous! I’m a huge fan of dirty lilacs but grilac? If I ever use that term I give permission to shoot me in the face. Definitely someone needs to stop this epidemic. I think the colours are gorgeous, especially for an office bod like me where bright reds and pinks are a total no go. I’m not really bothered about the word, but the colour doesn’t excite me much! Love all the others though, especially the far left. lol I really want the Grilac one! Actually I’d like it better if it was named violrey. Hehe. The Grilac one is quite a gorgeous colour, but i agree the name is ridiculous. It sounds like a kind of disease to me!